Documents obtained by the Project On Government Oversight name seven retired Marine Corps officers—including the Secretary of Defense and the President’s new Chief of Staff—who sought and obtained permission from the Marine Corps to be paid to work on behalf of foreign governments and companies after they retired. POGO acquired the documents through a Freedom of Information Act (FOIA) request. Under current law, any retired or reserve members of the military wishing to work for a foreign government or receive emoluments (a salary or payments) from one must obtain approval from the Secretary of their military service and from the Secretary of State. A FOIA request for the names of any officers who were granted approval from January 2000 to April 2017 showed Secretary of Defense James Mattis, White House Chief of Staff John Kelly, former National Security Advisor to President Obama retired General James L. Jones, and former Marine Corps Commandant General James Amos all sought and received permission. High-ranking military officers are regularly called by the Department and Congress to provide advice on national security issues with the assumption that their sole loyalty is to the interests of the United States. It should be clear to policymakers and the public if their advice may be influenced because they are receiving money from or have previous professional relationships with foreign governments. “These individuals are trading on the special trust and confidence bestowed upon them by the American people for their own personal gain,” Jack Shanahan Fellow Dan Grazier, a former Marine Corps captain, said. POGO is still waiting for responses to similar requests from the Army, Air Force, Navy, and State Department. The document provided by the Marine Corps shows Secretary Mattis asked for permission to work as a military advisor to the United Arab Emirates in 2015. Mattis’s last position in government was as the commander of Central Command (CENTCOM) from 2010 to 2013, which included the United Arab Emirates (UAE) in his area of responsibility (AOR). Mattis did not list this employment in his public financial disclosure form. Director of Defense Press Operations Captain Jeff Davis said that because Secretary Mattis did not receive compensation—other than reimbursement for travel expenses—he didn’t think that work needed to be included on his ethics disclosure. Davis told CNN the Office of Government Ethics told Mattis did not need to disclose the information. Mattis did list other uncompensated positions, including the U.S. Naval Institute and Center for a New American Security. Davis said that even though the Secretary didn’t report this relationship to the Office of Government Ethics he did tell the Senate Armed Services Committee and included the information in his security clearance review. The Committee would not confirm or deny what information it received regarding this employment to POGO. The Marine Corps regularly collaborates with the UAE for training. Even before seeking permission to be an advisor to the country, Mattis spoke positively of the country’s military capabilities, referring to them as “great warriors” and “Little Sparta” to The Washington Post in 2014. The UAE similarly admires the Marine Corps, participating in a number of exchanges and requesting formal training programs from the Corps. 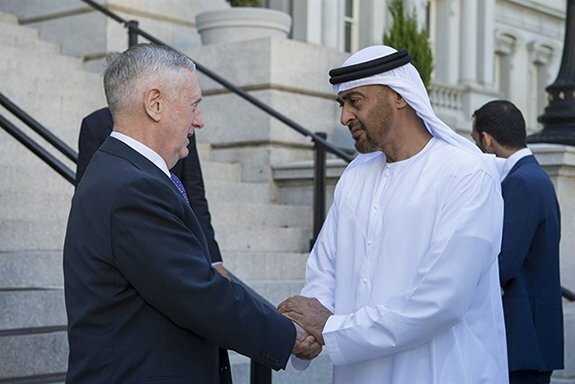 Secretary Mattis’s previously undisclosed relationship with the UAE could also add a new dimension to recent controversies surrounding the UAE’s role in convincing President Trump to support a blockade on Qatar. New White House Chief of Staff and former Homeland Security Secretary Kelly worked as a senior course mentor for the 2016 Australian Defense Force Joint Task Force Commanders Course before joining the current administration. But unlike Mattis, Kelly disclosed it in his financial disclosure forms. In his ethics agreement Kelly said he would “not participate personally and substantially in any particular matter involving specific parties in which Australia, is a party or represents a party,” until he received his full payment unless otherwise authorized. Other retired officers working for foreign governments are not currently in government, and do not have obligations for public disclosure under current laws. A number of officers accepted positions in companies receiving funding from countries in the Middle East. After he left government former Obama National Security Advisor James L. Jones worked as an independent security consultant with Ironhand Security, LLC, who he claimed had a pending contract with the Minister of Defense for the Kingdom of Saudi Arabia. Retired Major General Arnold Punaro, who sits on the Defense Business Board, also received permission to be an independent security consultant with the company. Even though the Defense Business Board provides the Department advice—including the infamous proposal to cut spending by $125 billion over five years—there are no financial disclosure requirements for board members or prohibitions on them receiving money from foreign governments. Retired Major General Thomas L. Moore became a Senior Consultant for Stark Aerospace Business Development in Israel after he was Chief of Staff and Acting Deputy Commander of CENTCOM. The disclosures also show several retired officers working for Asian companies. Former Marine Corps Commandant James Amos received permission to join the board of VT Systems Inc, an engineering firm that is a subsidiary of Singapore Technologies Engineering and has offices in the UAE and Brazil. Retired Brigadier General Ronald F. Baczkowski, who was the deputy commander of Marine Corps Forces, Pacific, received permission to be the North American Business Development Director for Singapore Technologies Kinetics. The documents provided to POGO show other officers who received permission but whose names were redacted under a “b6” exemption, which prohibits disclosure of personal information “when an individual’s privacy interest in it outweighs any public interest.” When the public interest outweighs those privacy concerns, agencies can release the information. POGO plans to appeal the redactions. Current laws require public disclosure for foreign lobbying but are less transparent when it comes to other forms of foreign influence. Under the Foreign Agents Registration Act (FARA) anyone who lobbies on behalf of foreign governments and political parties must register their activities with the Department of Justice and submit regular documentation describing their activities. As POGO Investigator Lydia Dennett recently detailed in written testimony for the Senate Judiciary Committee, that law has a number of weaknesses and enforcement problems that undermine the law’s goal of shining a light on how foreign governments attempt to influence US policies. But it is a significantly more public tool than the current system for monitoring how retired and reserve military officers work for foreign governments. As Congress investigates and evaluates the sufficiency of current foreign influence transparency laws, they may also want to look into making whether others who receive money from or work for foreign governments should make that information publicly available.